I’m an adult now (and have been for some time) so I shouldn’t really need excuses to eat my vegetables. But I still kind of do. It’s not that I don’t like them…but I don’t necessarily jump for them either. That is, unless they’re made in an especially tasty manner. 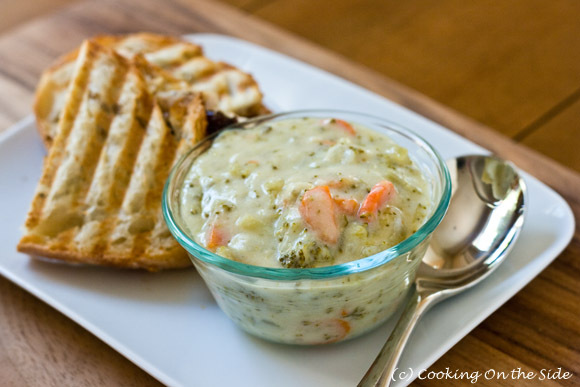 This Creamy Broccoli Soup definitely qualifies. As you can see in the photos, there are more vegetables than just broccoli in this soup, the recipe for which I found on the back of a pack of fresh broccoli. Carrots and celery add to the fresh flavor (from a photographic standpoint, I appreciate the punch of color too). There’s no heavy cream involved here, but there is a bit of butter. Embrace it – the gentle buttery-ness is what really makes the soup especially savory and appealing. I, of course, paired the soup with panini (the recipe for which will be posted on my other blog, Panini Happy, later this week) but it would also be great alongside roasts, salads or just a bowl on its own with some crusty bread. In a large pot bring water and onion salt to boil and add broccoli, celery and carrots. Bring to a boil, drain and set aside. Sauté onions in butter until tender. Stir in flour to form a smooth paste. Slowly add broth and milk, stirring constantly. Bring to a boil. Let boil for 1 minute: add vegetables and remaining ingredients. Reduce heat, cover and simmer for 30 to 40 minutes until tender. Can be prepared 24 hours in advance – refrigerate any leftovers. .-= Anshika´s last blog ..Broccoli Tikkis For The Evening Tea =-. This soup looks so nice and comforting. Perfect for fall! tasty soup! 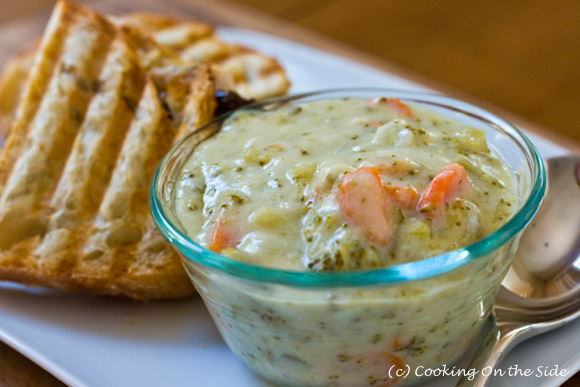 I have recently tried creamy broccoli soup for the first and I fell in love! I can’t wait to try out this recipe. .-= Jessie´s last blog ..Baked Fontina Pasta with Grilled Turkey Sausage =-. This reminds me of the soup you get in a diner. I had forgotten just how thick and amazing broccoli soup can be. I can’t wait to try it! haha I love how you start off your entry! I think adults do need a little push to eat their veggies sometimes. I know that for me, I need LOTS and LOTS of dip sauce to eat carrots. I think this soup will do the tip! wow, the soup looks really thick and creamy! It’s like a dip! .-= pigpigscorner´s last blog ..Chocolate Guinness Cake =-. What a beautiful soup. Creamy and delicious! .-= gaga´s last blog ..Hot & Sour Cabbage =-. Lovely recipe. Can’t wait to try it out. I have all the ingredients in my kitchen! .-= Danielle´s last blog ..# 95. Watch 10 movies my fiancé wants to watch that I would never be interested in (8/10) – Superman / Batman: Public Enemies =-. I made this soup and it was so yummy. I plan on making it again this weekend! I have even given the link to this to family and friends and they tried it and enjoyed it too. Certainly a winner! Isn’t it a good one? So glad you all enjoyed it! I made this soup for lunch today and it was so yummy! I’m so glad I have some left to have tomorrow!